Pioneers in the industry, we offer autofy horn for bikes from India. 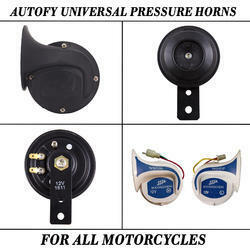 Autofy horn is available at a very low and reasonable cost. This 12V vibration sound powerhouse works at 100+dB and helps you to get noticed from a distance. It is made from aluminium and designed to be waterproof, anti-dust and anti-corrosion. It uses low battery, built using advanced vibration technology to create heavy and loud noise. The shiny metal chrome finish gives your Harley Davidson, Bullet, Royal Enfield, Thunderbird, Avenger, Pulsar, Duke KTM, Harley Davidson, Yamaha FZ, R15, CBR, Ninja, Apache, Hayabusa a totally different look.